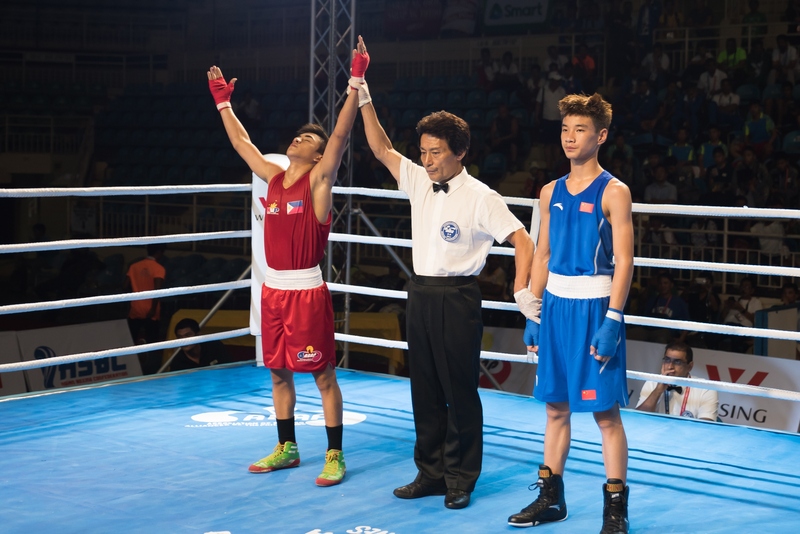 PUERTO PRINCESA, Philippines - Batang Pinoy and Palarong Pambansa standouts Criz Russu Laurente and John Vincent Pangga claimed unanimous decision victories over their opponents on opening day of the ASBC Asian Junior Boxing Championships at the City Coliseum on Wednesday, August 2. Brief but lively opening ceremonies featuring local groups entertained the foreign guests followed by short welcome remarks by PSC Commissioner Ramon Fernandez and ASBC Vice President Yousuf Ali Al Kazim. Laurente, youngest of a boxing brood from General Santos City which includes his father Cristino, one of the coaches, mother Rosalinda, who is an ABAP national referee-judge, and brothers Criz Sander and Criztian Pitt who are bemedaled national boxers, faced a much taller Cai Yujun in the preliminaries of the 48 kg light flyweight class.